What is it like to transition from the senior ranks of American journalism to a top job in an agency you once covered? Strobe Talbott found out when his old Oxford roommate, newly-elected President Bill Clinton, asked him to join the State Department. Talbott went on to serve for seven years as Deputy Secretary of State. For 21 years, through the 1970s and 1980s, Talbott worked as a journalist for Time magazine, focusing primarily on Soviet-American relations. He also gained notoriety — and a few years of persona non grata status in the former Soviet Union — for translating Nikita Khrushchev’s memoirs. His work with Time led him to Washington D.C., where he continued to do foreign policy reporting and analysis, expanding his interests and expertise from Russia and Eastern Europe to include India, Latin America, China, and more. It was not until 1993 that Talbott became directly involved in government — when his fellow Rhodes Scholar President Bill Clinton invited him to become ambassador to Moscow. Although he turned this offer down, Talbott soon accepted another one. Weeks later Clinton’s Secretary of State, Warren Christopher, asked Talbott to help manage the European Bureau and our relations with the new states created by the breakup of the Soviet Union. After just a year, Talbott replaced Clifton Wharton as Deputy Secretary of State, a position he held from 1994 to 2001. In his ADST oral history, Talbott reflects on the transition from journalism to government — and the bureaucratic benefits and challenges of having a personal channel to the president. USAID’s Office of Foreign Disaster Assistance (OFDA) is perhaps the world’s premier international disaster assistance agency. It was not always that way. OFDA administrator Oliver “Ollie” Davidson knows this better than most. OFDA’s response to the devastating 1985 Mexico City earthquake was ernest and energetic, but not always well-targeted. In his oral history, Davidson recalls some hard lessons learned. Davidson entered OFDA, a bureau within USAID, only a few years after it was created in the aftermath of the 1963 earthquake in former Yugoslavia. The failure of international response efforts during that disaster led the United States to create a central coordinating office within USAID that could respond quickly, effectively, and on a massive scale. Davidson helped coordinate OFDA’s response during a major challenge to the young organization: the 1985 Mexico City earthquake. The 8.0 magnitude earthquake caused nearly four billion dollars in damage to Mexico’s capital city, and took the lives of thousands of people. Though Mexico City had particularly rigorous building codes, enacted after earthquakes in 1957 and 1973, these safeguards proved woefully inadequate to prepare the city for a seismic event as destructive as that of 1985. In addition to the immediate toll of death and destruction, Mexico City faced enormous challenges in the days following the quake. The number of people with access to potable water dropped from six million to 90,000. Forty percent of the population was without electricity, and seventy percent had no telephone service. Hundreds of schools collapsed, and hundreds of thousands lost their jobs. Facing this crisis, the OFDA sprang into action as best it could. Although it did not yet have much experience with disasters of this magnitude, a few protocols were in place. OFDA worked in conjunction with the FBI, the military, and several volunteer organizations to provide aid to Mexico City. OFDA did a lot of good, but as Davidson candidly recalls, it made mistakes as well. In the end, OFDA led the American disaster response, and learned tough lessons that made it a better agency. After decades of right-wing dictatorship, Portugal faced a threat of a takeover by communists in the mid-1970s. Ambassador Frank Carlucci, who went on to become Secretary of Defense, headed up efforts to prevent the first loss of a NATO member state to the alliance’s political and ideological foes. That meant engaging with parties and politicians across the political spectrum, engaging the Portuguese press, and working hard in Washington to convince a skeptical Henry Kissinger that non-communist Portuguese leftists — notably the socialist Foreign Minister Mario Soares — had a realistic chance to prevail. The downfall of dictatorship in 1974 led to two years of political confusion in Portugal, the independence of Portugal’s African colonies, and the emergence of a Socialist government led by Soares following free elections in 1976. And Portugal remained in the NATO alliance. Carlucci’s anti-communist political strategy proved effective. Carlucci went on to become the Deputy Director of the CIA under President Carter (1978-81), the White House National Security Advisor (1986-87) under President Reagan, and finally the Secretary of Defense (1987-89), also under Reagan. Carlucci retired in 1989. Ambassador Frank Carlucci was interviewed by ADST’s Charles Stuart Kennedy, beginning on December 30, 1996. Fighting opium production in Afghanistan before 9/11 meant working with the Taliban. Veteran foreign service officer James P. Callahan found ways to do that. He recalls a time when U.S. interests in combating the heroin trade aligned with those of the Taliban, and when efforts to curb opium production had some success. From 1999 to 2001, Callahan served as office director for INL covering Africa, Asia, and Europe. INL assists local governments in developing anti-drug policies and operations, as well as in training local official to execute these policies. In the vacuum created by the Soviet exit in 1989, Afghanistan remained volatile, and became a hotbed of drug production and extremist activity. Callahan found that the war on drugs and the fight against terrorist extremism were often one and the same. And in that era, the United States and other international partners found ways to enlist the Taliban’s help in limiting the growth and cultivation of the opium poppy. A USAID officer secured a meeting with two senior and notorious Afghan warlords in the late 1980s when he appeared as an unexpected (and unwanted) guest in their homes. Adhering to the Pashtun code of conduct requiring hospitality be offered to every guest. Gulbuddin Hekmatyar and Abdul Rasul Sayaaf reluctantly — but courteously — welcomed Crandall, offering him refreshments and conversation. The relationships that Crandall cultivated during his tour in Pakistan as Director of the Cross-border Program from 1985-1990, and his access to Afghan leaders, proved valuable to the U.S. government in attempting to understand and influence Afghan affairs. At the time, the United States was supporting anti-Soviet mujahideen militia. Hekmatyar and Sayaaf were prominent mujahideen leaders. After the Soviet Union invaded Afghanistan on Christmas Eve in 1979, militia groups battling the pro-Soviet government in Kabul escalated their resistance, uniting to carry out a growing program of guerrilla warfare — with U.S. backing. Collectively referred to as “the mujahideen,” these independent militias were led by regional tribal commanders. In the early to mid-1980s, seven of the major mujahideen parties formed a loose alliance to present a common front and point of contact for the international community: the Seven Party Mujahideen Alliance or, simply, the Peshawar Seven. Peshawar was the primary destination for Afghan refugees fleeing to Pakistan and served as the political center for the Afghan resistance. Many of the Peshawar Seven were extremely anti-American, so much so that they refused to meet with Americans, or even allow Americans into larger meetings. However, through extensive Afghan connections, USAID officer Lawrence Crandall was able to meet with Gulbuddin Hekmatyar, founder and leader of the Hizb-i-Islami group and a major force in Afghan affairs for decades to follow. In his ADST oral history, Crandall discusses the circumstances that led to his meeting with Hekmatyar and Abdul Rasul Sayaaf, another member of the Peshawar Seven. Kidnappings, particularly those of high-ranking political officials, were not uncommon in 1970s Uruguay given the prominence of an urban guerilla group called the Tupamaros. Mistaken as someone with great importance, junior diplomat Mark Gordon Jones was kidnapped by the group in 1970. In “one of the dumbest luck things that could ever happen,” Jones was able to escape, and was subsequently removed from the country. Unfortunately, USAID Public Safety Advisor Dan Mitrione was not as lucky and was brutally murdered by the Tupamaros shortly after his kidnapping. The Tupamaros were founded in the early 1960s on leftist principles of overcoming entrenched socio-economic divides in Uruguay. They were initially known for distributing food and money in the poorer areas of Uruguay. They soon provoked the government and military into brutal responses, which helped increase the group’s popular appeal. By the early 1970s, however the Tupamaros adopted a policy of kidnapping and assassination which led to an erosion of popular support and heavy-handed repression by the Uruguayan government. Finally, by 1973, arrests and killings by the government successfully terminated the presence of the Tupamaros. Few Americans have met personally with the leadership of both Mao Zedong’s China and Chiang Kai-shek’s Taiwan. Sheila Platt, and her husband Nicholas Platt, are among that select group. Sheila Platt dropped out of Radcliffe in 1957 to join her Foreign Service husband in a storied diplomatic career that led him to ambassadorships in Zambia, the Philippines, and Pakistan. Much of his career — and her experience — was focused on China. Sheila did pioneering social work, led embassy activities, and advanced the cause of American diplomacy in all these assignments. When she began her work, the State Department did not permit married women to serve as Foreign Service officers. Hers is a story of the grit, determination, and unremunerated service of Foreign Service spouses in that era. As the Communists swept through a devastated post-war China in 1949, the battered Nationalists under Generalissimo Chiang Kai-shek fled to Taiwan and set up government there. While the Taiwanese government was neither democratic nor free, it was a U.S. ally because of its staunch anti-communist position and willingness to work with the United States to advance diplomatic, military, and intelligence objectives in the region. Nick and Sheila Platt went to Taiwan in 1962 to study the Chinese language, then moved to Hong Kong, where Nick served as a political officer. In 1971, President Nixon made his famous visit to China and began the process of normalizing relations with mainland China under Chairman Mao Zedong and Premier Zhou Enlai. 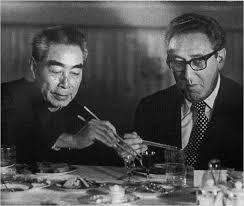 Nicholas Platt was intimately involved in these overtures, working closely with Henry Kissinger. Nick and Sheila were among the first Americans to arrive in China and serve at the U.S. Liaison Office in Beijing — where the United States still had no official embassy. While language students in Taiwan, the Platts were invited to a swank reception at which Generalissimo Chiang and the formidable Madame Chiang summoned them to the pavilion where they were holding court. Nicholas Platt’s uncle, Joseph H. “Sandy” Choate III, had been a counselor to one of Chiang Kai-shek’s rivals, and the Chiang family respected his work. Many years later, both Platts met Mao Zedong’s equally formidable wife, the feared Madame Mao, at a reception. 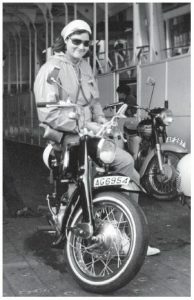 Nick Platt read excerpts from Sheila Platt’s diary concerning the Chiang Kai-shek incident into his ADST oral history. He also recounted their meeting with Madame Mao following a concert in Beijing by Eugene Ormandy and the Philadelphia Orchestra. In addition to her work at embassies, Sheila Platt pursued a career in social work that began in Hong Kong, where she cared for refugees from mainland China. She would later help orphans in Tokyo and serve as a mental health advisor in Zambia and the Philippines, with a speciality in post-traumatic stress disorders. Not long after being rejected from her dream job of becoming a spy right out of college, Janet Ballantyne began her career with USAID in the Latin American Bureau. A strong personality who fought hard for every assignment she set her sights on, Ballantyne landed posts in Peru, Nepal, Morocco, and Nicaragua, and eventually worked as the Mission Director for USAID in Russia (1996-99). Rebuilding Rwanda after the genocide was no easy task. USAID tasked George Lewis to head up that agency’s efforts to help a nation heal after one of the most horrific episodes in recent history. He faced extreme ethnic animosity, a destroyed country, and an “epic event in the history of human movement,” the return of a million refugees. In April 1994, members of the numerically dominant Hutu ethnic group in Rwanda began a genocide against the Tutsi minority and any moderate Hutus who defended the Tutsi. Rwanda had struggled with a longstanding ethnic hatred between both groups, a hatred that was exacerbated by Belgian colonial rule, which had historically empowered the Tutsi minority. In 1994, the shooting down of the plane of Hutu Rwandan President Juvenal Habyarimana, and the insurrection of Uganda-based Tutsi refugees, were used as a justification for the killing of the Tutsi population. It is still not known who shot down the plane, but what is known is that approximately 800,000 Rwandans were murdered in a short, 100-day period. The response of the existing UN peacekeeping force was valiant but woefully inadequate, as its commander later detailed. France mounted a belated and controversial intervention, with primary focus on protecting French citizens. The genocide ended when predominantly Tutsi forces under Paul Kagame retook the country, prompting a massive outflow of Hutu refugees. Rwanda became a symbol of the failure of the international community to act. George Lewis was named head of the USAID mission to Rwanda in 1996 after 25 years with the agency. Lewis discusses the difficulties in reconciliation and the successes of USAID in a time and region marked by despair and tragedy. In a 1998 visit to Rwanda, President Clinton declared, “We can and must do everything in our power to help you build a future without fear, and full of hope.” It was George Lewis’s task to help deliver on this promise. Lewis’s interview was conducted by John Pielemeier on January 11, 2018. After the fall of Somalia’s dictator Mohamed Siad Barre in 1991, a civil war broke out between warlords. In the ensuing conflict, an estimated 350,000 Somalis died because of famine, disease, and war-time casualties. With the death toll mounting, President George H.W. 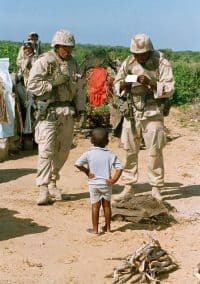 Bush sent a U.S.-led humanitarian force to Somalia. It was among the earliest examples of humanitarian intervention in armed conflict. General Anthony Zinni served as Operations Officer in what was dubbed “Operation Restore Hope.” In his oral history, Zinni recalls arriving at the ruins of the U.S. Embassy in Mogadishu to set up command, on a compound filled with refugees, stray animals, and dead bodies. General Robert B. Johnston commanded the force, which later gave way to a UN peacekeeping operation. Zinni went on to serve as President George W. Bush’s special envoy to Israel and the Palestinian Authority. General Zinni joined the Marine Corps in 1965, after completing his BS in Economics at Villanova University. During his first tour in Vietnam as Second Lieutenant, he trained South Vietnamese Marines. The tours following Vietnam included Japan, the Philippines, Germany, and Yugoslavia. General Zinni has held positions such as Deputy Director of Operations for the United States European Command (EUCOM) and Commander-in-Chief of the United States Central Command (CENTCOM). General Zinni was interviewed by Charles Stuart Kennedy in 2007.